"The church is that institution which affords proof of its utility and is found elevating the race, rousing the dormant understanding from material beliefs to the apprehension of spiritual ideas, and the demonstration of divine Science, thereby casting, out devils or error and healing the sick." - Science and Health, page 583, by Mary Baker Eddy. 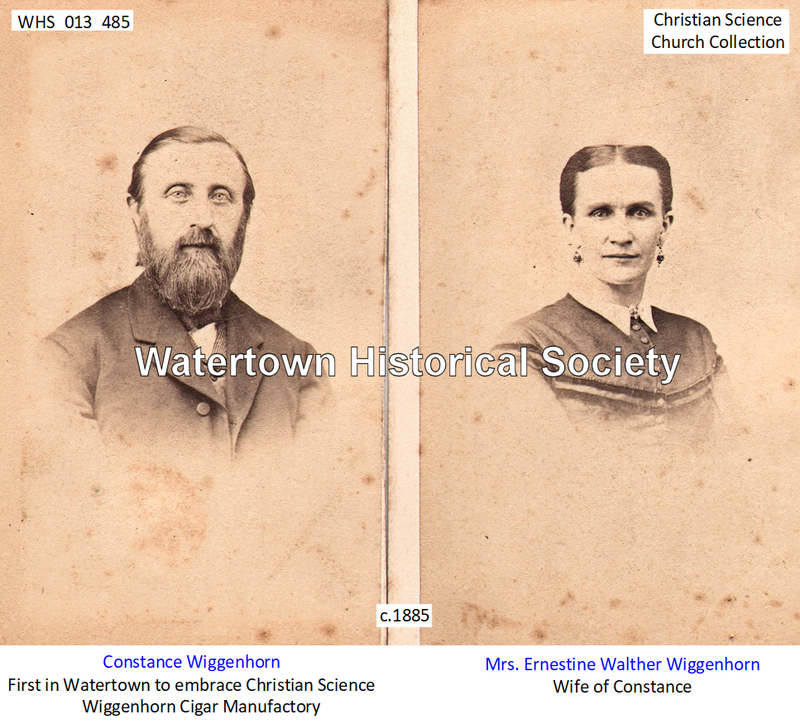 In October of 1888, Gustave A. Walther, C.S.D., Christian Scientist, of Wymore, Nebraska, a student of Mary Baker Eddy, enroute home from Boston, decided to stop off at Watertown to visit with his sister, Mrs. Ernestine Wiggenhorn. Upon arriving at his sister’s home, he found her grief-stricken over the serious illness of her husband, Constance Wiggenhorn, whom the doctors said could not live more than a few days, due to asthma. Mr. Walther went to the sick man and asked him if he was willing to turn to God, and Mr. Wiggenhorn, being unable to speak, weakly nodded "yes." Mr. Walther immediately began to give him Christian Science treatment, and after an hour and a half left him sleeping, the first natural sleep he had had in three weeks. The next morning when Mr. Wiggenhorn awoke, he asked his wife for a big breakfast and ate heartily. Two weeks later, he went back to his business fully healed. Following the healing of Mr. Wiggenhorn, Mr. Walther also healed Dr. Arthur Meyer, dentist, and the doctor’s mother, Mrs. Herman Meyer, of illness and other discordant conditions. These healings aroused great interest in Christian Science among relatives and friends, and thus the Faith began to gain followers in Watertown. These newly interested people began the daily study of Christian Science. A few of those who were first to experience healings studied under Mrs. Sarah Clark, C.S.D., of Milwaukee, authorized Christian Science teacher who conducted a class in the summer of 1895 at the home of Dr. A. Meyer, who was then residing in the Koeppler home on Third St. In the early fall of 1903, several students of Christian Science imbued with the desire to demonstrate more fully the Life divine, met Sunday mornings at the home of Constance Wiggenhorn, Sixth and Jefferson Streets, to read the Lesson Sermons used in all Christian Science churches. This led shortly to the organization of a Christian Science Society, and on September 30th, 1903, a meeting was held at the home of Mrs. Elizabeth March, Third Street, for the purpose of electing a committee to make arrangements for a permanent organization. 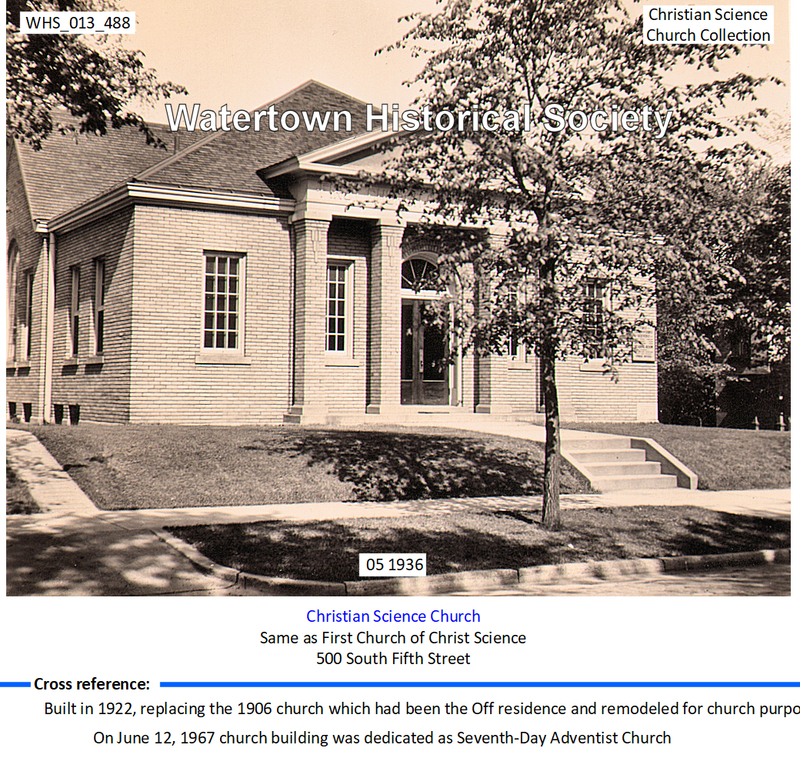 The following committee was elected: Dr. A. W. Meyer, Mrs. Emelyne Uehling, and John Kessler, Sr. On 0ctober 8th, 1903, First Christian Science Society of Watertown was organized at a special meeting. The charter members were: Mrs. Elizabeth March, Mrs. Mary Mathewson, Mrs. Bertha Huebbe, Mrs. Emelyne Uehling, Constance Wiggenhorn, John Kessler, Sr., Ernest Huebbe and Dr. Arthur W. Meyer. The first officers elected were: Mrs. Elizabeth March, First Header; Dr. Arthur W. Meyer, Second Header; John Kessler, Sr., President; Constance Wiggenhorn, Secretary- Treasurer; Mrs. Mary Mathewson, Mrs. Emelyne Uehling, and Mrs. Bertha Huebbe, Directors. Dr. A. Meyer was elected to draw up a Constitution and By-Laws, with the assistance of Mrs. Henrietta Graybill of Milwaukee. These By-Laws were adopted on October 14th, 1903. Shortly after the organization of the Society, the following new members were taken in: F. H. Roper, Mrs. Ida Keyes, the Misses Elsa and Meta May, Callie Mathewson, Linda Uehling, Frances Parker and Lydia Sleeper. The services of the new organization were held on the second floor of E. Owen’s music store, located at 113 Third Street. The first Christian Science lecture was delivered by Bicknell Young, C.S.B., of Chicago, Illinois, during June of 1904. 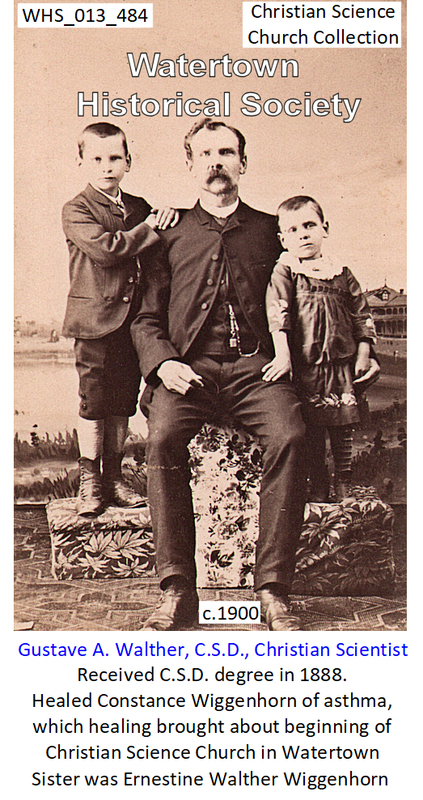 In December of 1905, Gustave A. Walther, C.S.D., who was the first to introduce Christian Science healing into Watertown, moved here with his family and they became members of the Society. 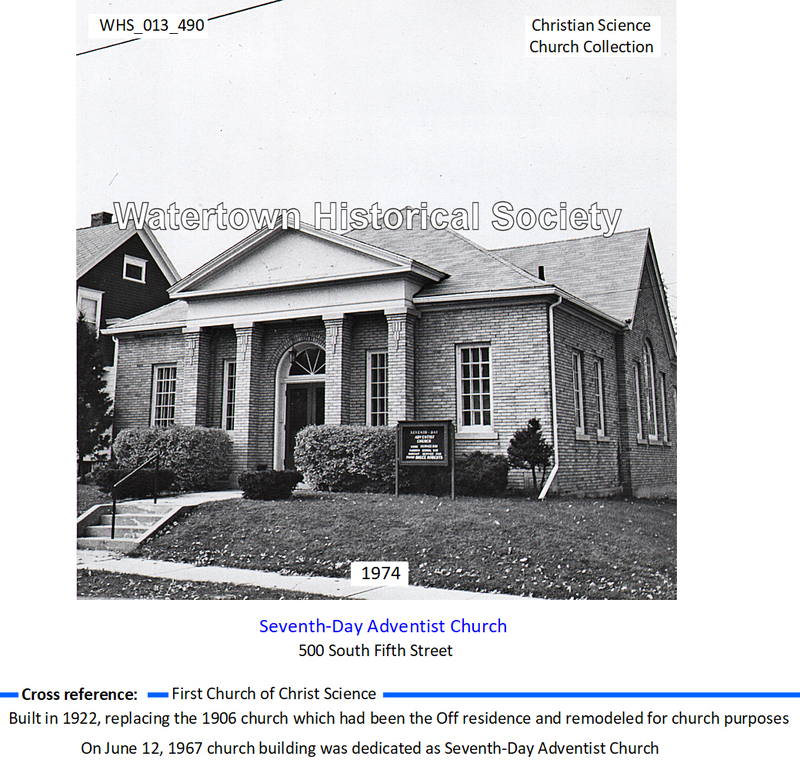 On May 3d, 1906, steps were taken to organize a Christian Science Sunday School and Gustave A. Walther, C.S.D., was elected Superintendent and Teacher, with Mrs. Walther as Assistant Teacher. Sunday School work has been carried on ever since and some of the scholars are now members of the church. In the spring of the year of 1906, the little Society decided to reorganize as a church, and was incorporated according to the Statutes of State of Wisconsin and in conformity with the Manual of The Mother Church, The First Church of Christ, Scientist, in Boston, Massachusetts. 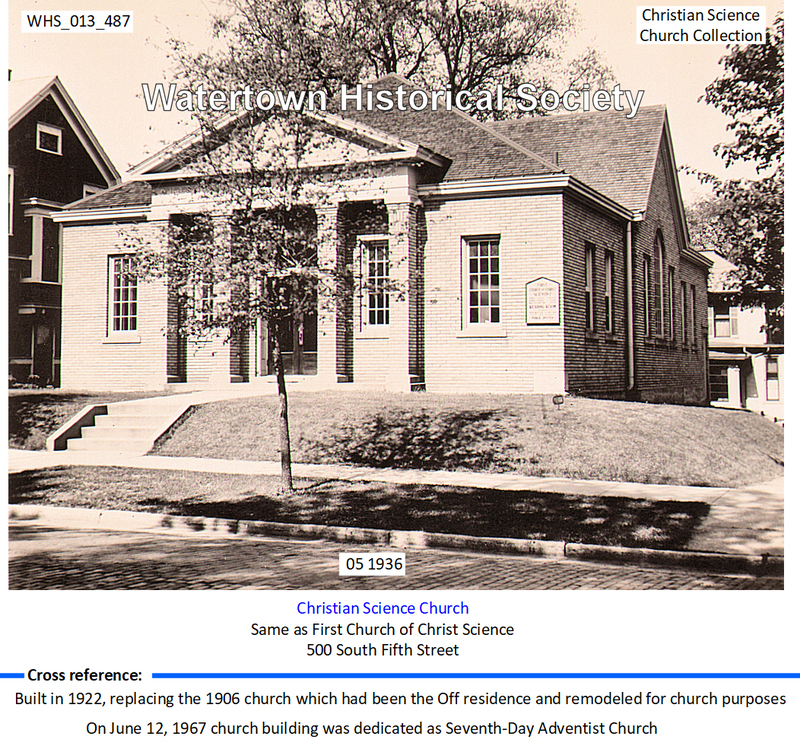 The name was then changed to First Church of Christ, Scientist, Watertown, Wisconsin. With the Society now organized as a church, a Christian Science Reading Room was established and cards notifying the public of the reading room hours and the time of church services were placed in hotels and all public places permissible. For many years the reading room was located on the third floor of the Hertel and Hoffmann building. On July 1st, 1906, the church moved into the Off residence [ William and Aurora (widow of Ernst) ], located on the corner of Fifth and Spring Streets, which had been given to the organization as a gift by the heirs, Mrs. Mathes and Mr. Off. In accepting this gift, the church agreed to assume a small indebtedness on the property, which was later removed by the church. The building was remodeled for church purposes and served the congregation until the year 1922, when it was out-grown. It was then torn down and the present edifice was erected on the same site. COL. P. H. SWIFT and MRS. MARY SWIFT, C. S.
The first registered Christian Science Practitioner to join the Society was Mrs. Mary Swift, C. S., wife of Col. P. H. Swift, coming here from Rice Lake in January of 1907. A s a practitioner Mrs. Swift was very successful in the field and her healing work helped to build up the Society. She was greatly loved by all who knew her. Col. Swift, also a member of the Society, edited and published a daily and weekly newspaper known as the Watertown Leader, during his residence here. While the new edifice was in the process of construction, services were held in the Majestic Theatre building. The building of the new structure was started in May of 1922, and on July 15th, at five o’clock in the afternoon, the corner-stone was laid, and the First Reader, Miss Evie Harden, conducted an appropriate and impressive service in the presence of the members of the Board of Directors and the Building Committee. Those serving on the Board of Directors at that time were: Dr. A. W. Meyer, Mrs. Amy Ullrich, Mrs. Helen D. Meyer, Mrs. Louise Brill, and G. T. Green; and the Building Committee was composed of Miss Linda Uehling, Dr. O. E. Meyer, Mrs. Amy Ullrich, Dr. Arthur W. Meyer and Miss Evie Harden. The following books and publications: the Bible; Science and Health with Key to the Scriptures, and the Church Manual of The First Church of Christ, Scientist, in Boston, Massachusetts, by Mary Baker Eddy; The Christian Science quarterly; The Christian Science Journal; The Christian Science Sentinel; Der Herold; Le Heraut, and the Christian Science Monitor, together with a list of names of the members of the church were placed in the corner-stone and sealed. The new edifice is of cream brick in Georgian Colonial design throughout and has a seating capacity of about 250. The cost of the building complete with the furnishings was about $14,000, which amount was pledged without solicitation. 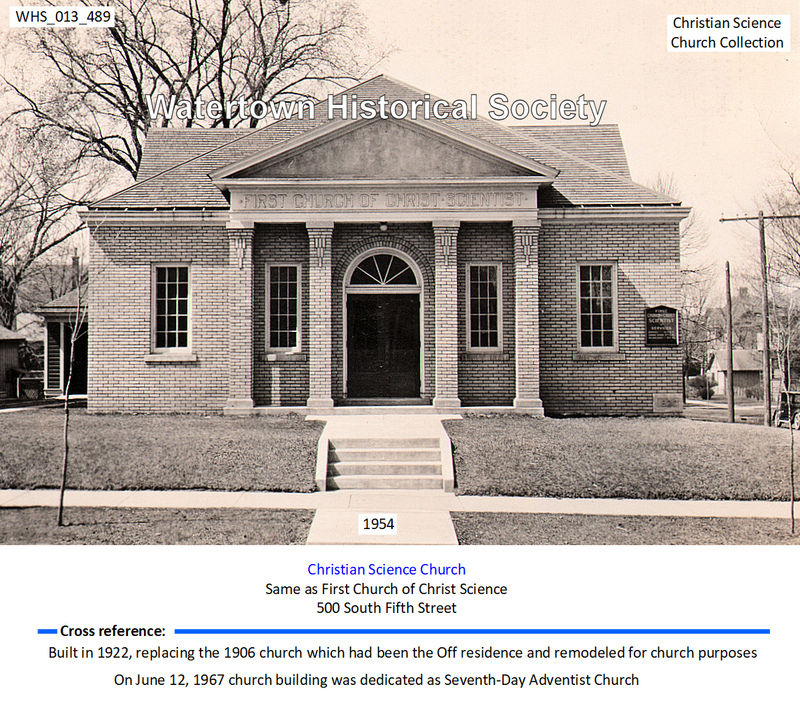 The opening service was held in the new edifice on February 11, 1923, and the dedication service on December 7th, 1924, when the church building was completely paid for. "Hitherto hath the Lord helped us." --I Sam. 7:12. The Robert Morton pipe organ, one of the finest in the city, was installed in the spring of 1930, being the gift of Mr. and Mrs. Henry Boeger, of Beverly Hills, California. Mrs. Boeger is a former member of the church. Throughout the many years that this church has been in existence, the members have had but one desire: to be "steadfast, unmovable, always abounding in the work of the Lord, for as much as ye know that your work is not in vain in the Lord." --I Cor. 15:58. Among the early workers, Miss Linda Uehling and Dr. Arthur W. Meyer each served the church faithfully as First Header for many years. At the present time Readers are elected each year with the privilege of serving three years if re-elected. The Christian Science Reading Room is now located in the church edifice, where all authorized Christian Science literature may be read, borrowed or purchased. It serves to inform and enlighten those seeking the understanding of Christian Science, and is open to the public every Wednesday and Saturday afternoon from three to five o’clock, excepting legal holidays. A free lecture on Christian Science is given each year under the auspices of this church, by a member of the Christian Science Board of Lectureship of The Mother Church, The First Church of Christ, Scientist, in Boston, Massachusetts. Many healings occur at these lectures and many discordant conditions are overcome through a right understanding of the Truth of Being. The present officers are: Mrs. Ada Burns, First Reader; Mrs. Louise Brill, Second Reader; Mrs. Amy Ullrich, President; Mrs. Elsie Guenther, Clerk; Mrs. Lucille Bailey, Treasurer; Mrs. Amy Ullrich, Mrs. Laura Parsons, Homer Ryder, Mrs. Millie Horton and Mrs. Helen D. Meyer, Board of Directors; Mrs. Millie Norton, Superintendent of Sunday School; and Miss Doris Meyer, Librarian of the Reading Room. Constance Wiggenhorn, Ernestine Walther Wiggenhorn, wife of Constance. Constance was first in Watertown to embrace Christian Science. Wiggenhorn Cigar Manufactory.